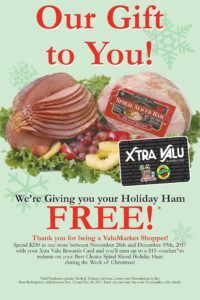 Thank you for being a ValuMarket Shopper! 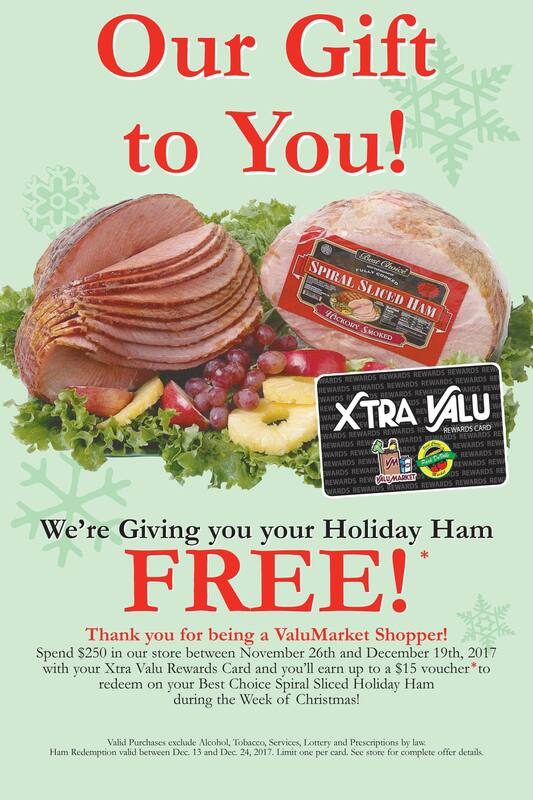 Spend $250 in our store between November 26th and December 19th, 2017 with your Xtra Valu Rewards Card and you’ll earn up to a $15 voucher to redeem on your Best Choice Spiral Sliced Holiday Ham during the Week of Christmas! *Up to $15.00. Valid Purchases exclude Alcohol, Tobacco, Services, Lottery and Prescriptions by law. Ham Redemption valid between Dec. 13 and Dec. 24, 2017. Limit one per card. See store for complete offer details.